In the first complete year of data under the Trump administration, the 2017 Current Population Survey showed that poverty to continued the three-year trend of declining. The national poverty rate declined by only 0.4 percentage points from 2016 to 12.3 percent. Although the poverty rate declined very slightly the trend is flat from last year because, according to the U.S. Census, it was not a statistically significant change from 2016 estimates. Median household income also increased for the third consecutive year, but this was due to an increase in employment rather than an increase in wages—real median earnings for full-time workers actually declined from 2016 to 2017. And income gains have been largely concentrated among the wealthiest—while median income has finally recovered to the same level as before the Great Recession in 2007, the incomes of the richest 10 percent increased between 2007 and 2017 while those of the poorest 10 percent declined. Health insurance rates did not increase for the first time in seven years, likely due to the Trump administration’s attempts to dismantle the Affordable Care Act. In 2017, 39.7 million Americans, including 12.8 million children, lived in poverty. The poverty rates decreased a statistically significant amount in 19, held steady in one state—Vermont—and increased in nine states—the increase was only statistically significant in West Virginia and Florida. Colorado increased the income eligibility for its Child and Dependent Care Credit to $150,000 and increased the percent of the federal credit that can be claimed to 80%. The Supplemental Poverty Measure (SPM) released alongside the official poverty measure, demonstrates that the tax code can be used as an effective poverty-fighting tool. The federal EITC and refundable portion of the Child Tax Credit, for example, together lifted 8.3 million people out of poverty decreasing the supplemental poverty rate from 16.5 to 13.9 percent. This rate was unchanged from the previous year. And, thanks in large part to those credits, the supplemental poverty rate for children is actually lower than their official poverty rate (15.6 percent compared to 17.3 percent). Astonishingly, tax policies in virtually every state make it harder for those living in poverty to make ends meet. When all the taxes imposed by state and local governments are taken into account, every state imposes higher effective tax rates on poor families than on the richest taxpayers. Despite this unlevel playing field states create for their poorest residents through existing policies, many state policymakers have proposed (and in some cases enacted) tax increases on the poor under the guise of “tax reform,” often to finance tax cuts for their wealthiest residents and profitable corporations. State and local tax systems typically make things harder for families living in poverty. A 2015 ITEP report, Who Pays? A Distributional Analysis of the Tax Systems in All 50 States, found that the poorest 20 percent of Americans paid on average 10.9 percent of their incomes in state and local taxes. Middle-income taxpayers didn’t fare much better, paying an average of 9.7 percent of their incomes toward those taxes. But when it comes to the wealthiest 1 percent, ITEP found they paid an average of just 7 percent of their incomes in state and local taxes. Nearly every state and local tax system takes a much greater share of income from middle- and low-income families than from the wealthy. This “soak the poor” strategy from a budgeting perspective does not yield much revenue compared to modest taxes on the rich. It also pushes low-income families further into poverty and increases the likelihood that they will need to rely on safety net programs. There is a better approach. Just as state and local tax policies can push individuals and families further into poverty, there are tax policy tools available that can help them move out of poverty. In most states, a true remedy to improve state tax fairness would require comprehensive tax reform. Short of this, lawmakers should use their states’ tax systems as a means of providing affordable, effective and targeted assistance to people living in or close to poverty in their states. Through the use of tax policy tools, state lawmakers can take steps to improve the standard of living for low-income residents. Similar to the way in which the Supplemental Nutrition Assistance Program (SNAP) helps families put food on the table, thoughtful changes to state tax codes can help struggling families pay for necessities. This report presents a comprehensive overview of anti-poverty tax policies, surveys tax policy decisions made in the states in 2018, and offers recommendations that every state should consider to help families rise out of poverty. States can jumpstart their anti-poverty efforts by enacting one or more of four proven and effective tax strategies to reduce the share of taxes paid by low- and moderate-income families: state Earned Income Tax Credits, property tax circuit breakers, targeted low-income credits, and child-related tax credits. The federal Earned Income Tax Credit (EITC) is widely recognized as an effective anti-poverty strategy. It was introduced in 1975 to provide targeted tax reductions to low-income workers and also to reward work and increase incomes. The federal EITC is administered through the personal income tax. To encourage greater participation in the workforce, the EITC is based on earned income, such as salaries and wages. For example, for each dollar earned up to $14,040 in 2018, families with three or more children will receive a tax credit equal to 45 percent of those earnings, up to a maximum credit of $6,431. Because the credit is designed to provide tax relief to the working poor, there are income limits that restrict eligibility for the credit. Families continue to be eligible for the maximum credit until income reaches $18,340 for single heads of household. Above this income level, the value of the credit is gradually reduced to zero and is unavailable when family income exceeds the maximum eligibility level. The credit is entirely unavailable to families with three or more children earning more than $49,194 if the head of household is single and $54,884 if married. For taxpayers without children, the credit is much less generous: the maximum credit is $519 and single filers earning more than $15,270 (or $20,950 for married couples without children) are ineligible. To date, nearly two-thirds of the states (29 states and the District of Columbia—see Appendix A) offer state Earned Income Tax Credits based on the federal EITC. All of the states except Minnesota allow taxpayers to calculate their EITC as a percentage of the federal credit (Minnesota’s credit is structured as a percentage of income rather than a percent of federal credit). This approach makes the credit easy for state taxpayers to claim (since they have already calculated the amount of their federal credit) and straightforward for state tax administrators. However, states vary dramatically in the generosity of their credits. The EITC provided by the District of Columbia, for example, amounts to 40 percent of the federal credit (100 percent for workers without dependents in the home), while six states have credits that are worth less than 10 percent of the federal credit. Six states (Delaware, Hawaii, Ohio, Oklahoma, South Carolina and Virginia) allow only a non-refundable credit, limiting the ability of the credit to offset regressive state and local taxes. In 2013, North Carolina became the first state to allow their EITC to expire. 2015, on the other hand, marked the beginning of a three-year trend of states and the federal government embracing new EITCs and improvements to existing credits. The federal government made EITC expansion provisions under the American Recovery and Reinvestment Act (ARRA) permanent for families with three or more qualifying children. California enacted a new refundable EITC targeted to families living in deep poverty. Massachusetts, New Jersey, and Rhode Island lawmakers boosted the value of their state credits and Maine lawmakers converted the state’s non-refundable EITC to a fully refundable credit. 2017 saw the addition of EITCs in Hawaii, Montana and South Carolina. Montana enacted a refundable credit at 3 percent of the federal credit. Hawaii’s non-refundable credit, which is set to expire at the end of tax year 2022, is set at 20 percent of the federal credit. South Carolina’s non-refundable credit is set to 125 percent of the federal credit, but because of the way the South Carolina credit is constructed much less of the credit will be taken up. Louisiana, Massachusetts, New Jersey and Vermont all increased the size of their EITCs in 2018. Louisiana upped its state’s EITC from 3.5 percent to 5 percent of the federal credit for tax years 2019 through 2025. Massachusetts increased its EITC from 23 percent to 30 percent of the federal credit, up from 15 percent in 2015. In New Jersey, lawmakers enacted an EITC increase from 35 percent to 40 percent of the federal credit to be phased in by 2020. And lawmakers in Vermont increased their EITC, currently at 32 percent of the federal credit, to 36 percent. There have also been some recent efforts to expand the EITC for workers without children. While the federal EITC provides a great deal of help for families with children, its impact is quite limited for those without children; the maximum credit is much smaller, and the income limits are more restrictive. For instance, under current law, a worker without dependent children in the home who is working full-time at the federal minimum wage is ineligible for the EITC. Yet, if the same worker had children they would receive the maximum EITC. Under the current system, these low-wage workers continue to be taxed deeper into poverty. Refundability is especially important in ensuring that deserving families get the full benefit of the state EITC. Refundable credits do not depend on the amount of income taxes paid: if the credit amount exceeds your income tax liability, the excess amount is given as a refund. Thus, refundable credits are useful in offsetting the regressive nature of sales and property taxes and can provide a much needed income boost to help families pay for basic necessities. In 2017, all but four states (Delaware, Ohio, Oklahoma, and Virginia) with EITCs offer a fully refundable credit, meaning that low-income families earning too little to owe state income taxes are ineligible for the credit. Delaware legislators passed a bill that would change the state’s nonrefundable 20 percent credit to a refundable 5.9 percent credit. The shift will benefit the state’s lowest income workers and their families, those who earn too little owe state income taxes, but to date it has not been signed by the governor. State EITCs generate bipartisan support because they are easily administered and relatively inexpensive. However, EITCs are most generous to families with children. Policymakers should be aware that because the EITC was designed to specifically help families with children it does little to benefit seniors and low-income individuals without children. There are other tax provisions offered by states, like enhanced personal exemptions or standard deductions, that are available to elderly taxpayers. But for millions of low-income workers without dependents in the home, federal and state taxes force them into or deeper into poverty. This subset of the population includes: working parents who do not live under the same roof as their kids, but want to provide for them; veterans and members of the military; and young workers just starting out whose low wages barely cover the cost of food and rent. The EITC itself can be modified to reach these otherwise excluded groups. Policymakers in Washington, DC, for example, enhanced the District’s EITC for workers without children in 2014, increasing eligibility thresholds and expanding the credit to 100 percent of federal. And more recently both California and Maryland joined the District in their expansion of the EITC to younger workers. In 2018, California eliminated the age requirement for its EITC for workers without dependents in the home. This action expanded the EITC to young workers between 18 and 24, and workers over 65. California also adjusted its state-level EITC income limits to reflect the state’s minimum wage increase to ensure that those working full-time for minimum wage are eligible to receive the credit. Maryland legislators also removed the state EITC’s minimum age requirement by using some of the revenue gained from the federal tax cut. Ohio Senator Sherrod Brown has proposed a similar policy at the federal level, and there are now multiple bills pending in Congress and a handful of states to implement such a change. These recent developments reinforce the importance of linking state EITC eligibility rules to the federal program, so that any federal expansions are immediately passed on to the states. Recommendation: To help alleviate poverty, lawmakers and advocates in states with EITCs should consider increasing the percentage of the existing credit, making the credits fully refundable, and improving the benefits for workers without children. Those in states without a credit should consider introducing a generous and refundable EITC tied to the federal credit. The hallmark of a truly effective low-income credit is that it is refundable. This means that if the amount of the credit exceeds the amount of personal income tax you would otherwise owe, you actually get money back. Refundability is a vital feature in low-income credits because for most fixed-income families, sales and property taxe take a much bigger bite out of their wallets than the personal income tax does. Refundable credits on income tax forms are the most cost-effective mechanism for partially offsetting the effects of regressive consumption taxes on low-income families. The recent trend to make credits nonrefundable as a measure of budgetary savings is misguided and ill-advised. States employ a wide variety of mechanisms to reduce the amount of property taxes that low- and moderate-income families pay, though they vary significantly in effectiveness. A property tax circuit breaker is the only property tax reduction program explicitly designed to reduce the property tax burden on those low-income taxpayers hit hardest by the tax. Its name reflects its design: circuit breakers protect low-income residents from a property tax “overload”, just like electric circuit breakers prevent electricity surges in our homes. When a property tax bill exceeds a certain percentage of a taxpayer’s income, the circuit breaker offsets property taxes in excess of this “overload” level. Fifteen states and DC offer property tax circuit breaker programs in 2017 that target tax reductions to low-income families who also owe significant property taxes relative to their incomes. Another 15 states provide property tax credits to some low-income families through credits based on income. By cutting off eligibility based on income, these credits do not include a provision requiring property taxes to exceed a set percentage of income to qualify for the credit (see Appendix B). The most effective and targeted property tax credits are circuit breaker programs made available to all low-income taxpayers, regardless of age, that are also extended to renters. Because it is generally understood that renters pay property taxes indirectly in the form of higher rents, many states now extend their circuit breaker credit to renters as well. The calculation is typically the same as the one used for homeowners, with the exception that renters must assume that their property tax bill is equal to some percentage of their rent. Renters in Maryland for instance, use 15 percent of their rent as their assumed property tax in calculating their circuit breaker credit. For a circuit breaker program to be successful, an effective outreach campaign is necessary. Recommendation: State lawmakers and advocates interested in reducing the property taxes paid by low-income homeowners and renters should consider introducing a robust circuit breaker program. States with circuit breaker programs only available to older adults or homeowners should consider expanding the program to low-income homeowners and renters of all ages. Every state could stand to improve its tax policies toward low- and moderate- income families. However, some states have a need to consider the reforms outlined in this report. 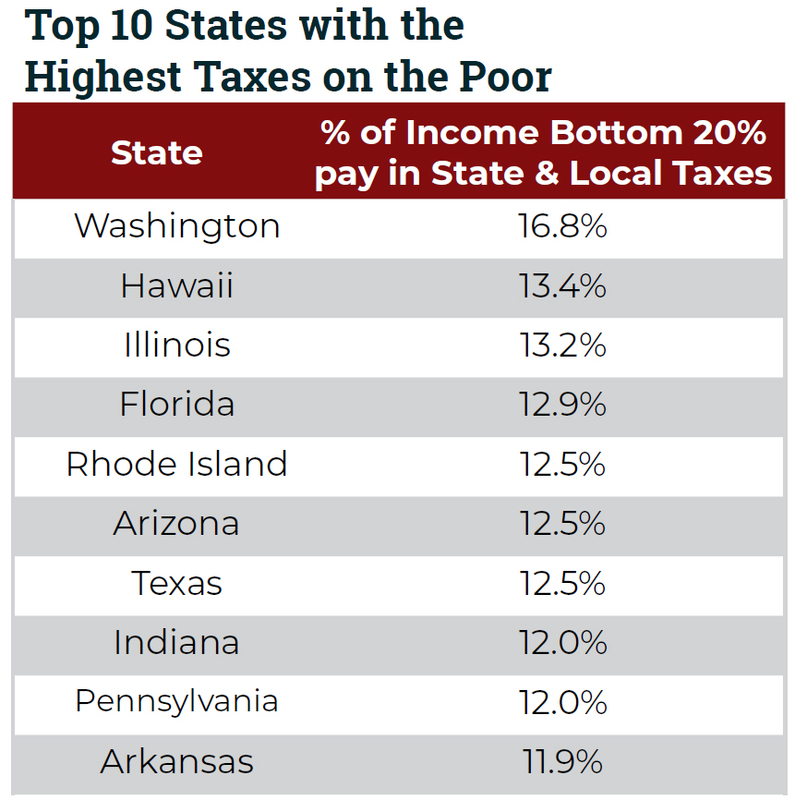 The chart to the right shows the 10 states with the highest state and local taxes on the poor as a share of income according to stronger ITEP’s 2015 Who Pays? report. Washington State, which does not have an income tax, is the highest-tax state in the country for poor people. In fact, when all state and local sales, excise, and property taxes are tallied up, Washington’s poor families pay 16.8 percent of their total income in state and local taxes. Compare that to neighboring Idaho and Oregon, where the poor pay 8.5 percent and 8.1 percent, respectively, of their incomes in state and local taxes—far less than in Washington. Hawaii, which relies heavily on consumption taxes, ranks second in its taxes on the poor, at 13.4 percent. Illinois—a state with a flat income tax rate—taxes its poor families at a rate of 13.2 percent, ranking third in this dubious distinction. Because the Earned Income Tax Credit is targeted to low-income working families with children, it typically offers little or no benefits to older adults and workers without children. Thus, refundable low-income credits are a good complementary policy to state EITCs (see Appendix C). Eleven states offer targeted income tax credits to reduce (or zero out) low-income families’ personal income tax contributions. For example, Ohio offers a nonrefundable credit that ensures that families with incomes less than $10,000 aren’t subject to the income tax. Kentucky offers a nonrefundable credit based on family size to ensure that families at or below the poverty level aren’t subject to state income taxes. Making these targeted low-income credits refundable would increase their effectiveness for low-income families. Seven states offer an income tax credit to help offset the sales and excise taxes that low-income families pay. Some of the credits are specifically intended to offset the impact of sales taxes on groceries. These credits are normally a flat dollar amount for each family member, and are available only to taxpayers with income below a certain threshold. They are usually administered on state income tax forms, and are refundable—meaning that the full credit is given even if it exceeds the amount of income tax a claimant owes. Refundability is crucial because it allows low-income credits to be used by taxpayers who have little or no income tax liability but pay a substantial amount of their income in sales taxes. For example, Idaho offers a refundable credit for each Idahoan and their dependents to offset grocery taxes even if taxpayers are not subject to the income tax. Kansas lawmakers eliminated their state’s refundable grocery tax credit in 2012 but enacted a new, less-effective nonrefundable credit in 2013. Recommendation: State lawmakers and advocates committed to making sure taxes don’t push families further into poverty should create refundable, targeted low-income credits especially to help offset regressive sales and excise taxes. In states where these credits already exist, lawmakers should act to enhance them, such as by making them refundable. Annual state and local data from the Census Bureau are often used to rank states as “low” or “high” tax states based on taxes collected as a share of state personal income. But focusing on a state’s overall tax revenues overlooks the fact that taxpayers experience tax systems very differently. In particular, the poorest 20 percent of taxpayers pay a greater share of their income in state and local taxes than any other income group in all but 15 states. And, in every state, low- and moderate-income taxpayers pay significantly more as a share of income than the top 1 percent of taxpayers. The District of Columbia is the only tax system where the poorest residents pay the least as a share if income compared to other residents across the income spectrum. No income-tax states like Washington, Texas, and Florida do, in fact, have average to low taxes overall. But, they cannot be considered “low-tax” states for poor families. Far from it. In fact, these states’ disproportionate reliance on sales and excise taxes make their taxes among the highest in the nation on low-income families. The bottom line is that many so-called “low-tax” states are high-tax states for the poor, and most do not offer a good deal to middle-income families either. Only the wealthy in such states pay relatively little. Child Tax Credits: Federal income tax law, under the Tax Cuts and Jobs Act (TCJA), temporarily expanded the Child Tax Credit to allow taxpayers to claim a $2,000 income tax credit for each dependent child under 17 years of age. The credit amount remains gradually phased out for high-income families, but increased to $200,000 ($400,000 for joint filers). A portion of the child tax credit is refundable for low-income families; the refundable portion is limited to $1,400. Six states currently offer a much smaller version of the child tax credit for qualifying families (Appendix D). Idaho and Wisconsin increased or established a child tax credit in 2018. The Colorado legislature previously passed a refundable, income-limited credit for families with children under six years old, but it is currently not funded. The law passed with the intent of funding the credit with revenue from internet sales collection once it became legal. Thanks to the US Supreme Court ruling in Wayfair v. South Dakota, states can oblige on retailers to collect and remit sales taxes. Colorado lawmakers will still have to pass additional legislation to fully fund and implement the credit. Child and Dependent Care Credits: The average cost of full-time child care can range from $3,000 to $17,000 per year depending on the age of the child and location of the family. Low- and middle-income working parents spend an increasingly significant portion of their income on child care. Families in poverty contribute over 30 percent of their income to child care compared to about 6 percent for families at or above 200 percent of poverty. Most families with children need one or more incomes to make ends meet which means child care expenses are an increasingly unavoidable and unaffordable expense. The federal government allows a nonrefundable income tax credit to help offset child care expenses. In 2017, single working parents (and two-earner married couples) with children 12 years of age or younger can claim a credit to partially offset up to $6,000 of child care expenses; low-income taxpayers can receive a credit of up to 35 percent of these expenses. The credit percentage gradually falls for higher-income taxpayers. This “sliding scale” approach helps to target tax relief somewhat more effectively to low-income taxpayers, but making the credit refundable would help those parents and children most in need. Nearly half of the states offer some form of state income tax break for families with dependent care expenses. Of those, the majority (23 states including the District of Columbia—see Appendix D) model their state credit after the federal credit. For example, Georgia allows taxpayers to take 30 percent of their federal child and dependent care credit as a nonrefundable child care credit. Nebraska takes a slightly different approach, offering both a refundable and a nonrefundable credit depending on a family’s income. The refundable child care credit is calculated as 100 percent of the federal credit for low-income filers with incomes under $22,000. Higher earners can claim a nonrefundable credit, equal to 25 percent of the federal credit once income levels reach $29,000. This approach targets the benefits of the Nebraska credit much more efficiently to low- and middle-income parents than does the federal credit. Recommendation: State lawmakers and advocates who want to help low-income families with children should consider increasing the value of existing child credits, making them refundable, or introducing a new refundable per child credit. Lawmakers and advocates interested in targeting child and dependent care credits to help families most in need would do well to make their credits refundable and make the credit available only to families with limited incomes. The tax policies described in this report are key to helping lift families out of poverty, but simply offering these credits is not sufficient. In order to ensure that as many eligible families benefit from these anti-poverty policies as possible, lawmakers should consider how to make the credits more accessible. A simple design, such as linking a credit to an already established credit (as is the case with state EITCs) is a good place to start. Allowing taxpayers to claim credits on their personal income tax forms (as opposed to filling out a separate form or application at a different time of the year) also increases the likelihood that eligible taxpayers will take advantage of the credits. Furthermore, policymakers, advocacy groups, and the media must work together to ensure that an effective outreach effort is established and adequately funded so that taxpayers are informed about these credits. Outreach programs should be frequently evaluated to improve the effective reach of the tax credits offered. WHICH STATES GET IT (CLOSE TO) RIGHT? Vermont’s tax system is among the least regressive in the nation because it has a highly progressive income tax and low sales and excise Vermont’s tax system is also made more fair by the size of the state’s refundable Earned Income Tax Credit (EITC)—32 percent of the federal credit—and a generous property tax circuit breaker credit. Delaware’s income tax is not very progressive, but its high reliance on income taxes and low dependence of consumption taxes results in a tax system that is only slightly regressive Similarly, Oregon has a high reliance on income taxes and very low use of consumption taxes. Both states also offer a state EITC. New York and the District of Columbia each achieve a close-to-flat tax system overall through the use of generous refundable EITC’s and an income tax with relatively high top rates and limits on tax breaks for upper-income A recent tax reform bill in DC lowered the income tax rate for middle-income earners, increased the standard deduction and personal exemption allowed, and expanded the EITC for childless workers. New York also provides a refundable Child Tax Credit based on the federal program, and both states vide property tax circuit breaker credits. It should be noted that even the least regressive states generally fail to meet what most would consider minimal standards of tax fairness. In each of these states, at least some low- or middle-income groups pay more of their income in state and local taxes than the wealthiest families must pay. State lawmakers and advocates interested in reducing the property taxes paid by low-income homeowners and renters should consider introducing a robust circuit breaker States with circuit breaker programs only available to older adults or homeowners should consider expanding the program to low-income homeowners and renters of all ages. State lawmakers and advocates who want to help low-income families with children should consider increasing the value of existing child credits, making them refundable, or introducing a new refundable per-child Lawmakers and advocates interested in targeting child and dependent care credits to help families most in need would do well to make their credits refundable and available only to families with limited incomes. Many American families continue to live in poverty, struggling to get by, and many state tax systems across the country do too little to offer the assistance low-income families need. In fact, regressive state tax structures can push working families and individuals even deeper into poverty. State lawmakers have a responsibility to ensure that their state’s tax code does not exacerbate this crisis and should consider using the low-income tax credits outlined in this paper as means of mitigating poverty in their states. Refundable tax credits are effective, time-tested anti-poverty solutions that provide additional income to help families pay for food, housing, transportation, and other necessities. The reforms discussed in this paper are among the most cost-effective anti-poverty strategies available to state lawmakers. The Earned Income Tax Credit (EITC) is a policy designed to bolster the earnings of low-wage workers and offset some of the taxes they pay, providing the opportunity for struggling families to step up and out of poverty toward meaningful economic security. The federal EITC has kept millions of Americans out of poverty since its enactment in the mid-1970s. Over the past several decades, the effectiveness of the EITC has been magnified as many states have enacted and later expanded their own credits. The effectiveness of the EITC as an anti-poverty policy can be increased by expanding the credit at both the federal and state levels. To this end, this policy brief provides an overview of the federal and state EITCs and highlights recent trends to strengthen these credits. Families in poverty contribute over 30 percent of their income to child care compared to about 6 percent for families at or above 200 percent of poverty. Most families with children need one or more incomes to make ends meet which means child care expenses are an increasingly unavoidable and unaffordable expense. This policy brief examines state tax policy tools that can be used to make child care more affordable: a dependent care tax credit modeled after the federal program and a deduction for child care expenses. Sales taxes are one of the most important revenue sources for state and local governments; however, they are also among the most unfair taxes, falling more heavily on low- and middle-income households. Therefore, it is important that policymakers nationwide find ways to make sales taxes more equitable while preserving this important source of funding for public services. This policy brief discusses two approaches to a less regressive sales tax: broad-based exemptions and targeted sales tax credits.